President Muhammadu Buhari has challenged the All Progressives Congress (APC) to go all out and win the governorship election in Ekiti State. The President gave the charge during a dinner with the APC South-west leaders on Wednesday at the Presidential Villa in Abuja. He asked the party leaders and members in the region to support the APC candidate and Minister of Solid Minerals Development, Dr Kayode Fayemi, come July 14, saying the poll is critical to the party’s victory at the general elections in 2019. “I know Ekiti fairly well and Ekiti people are well known for their forthrightness, candour and integrity; all of these values seem to have been lost and we must restore these values and return Ekiti to its pride of place in the comity of states. 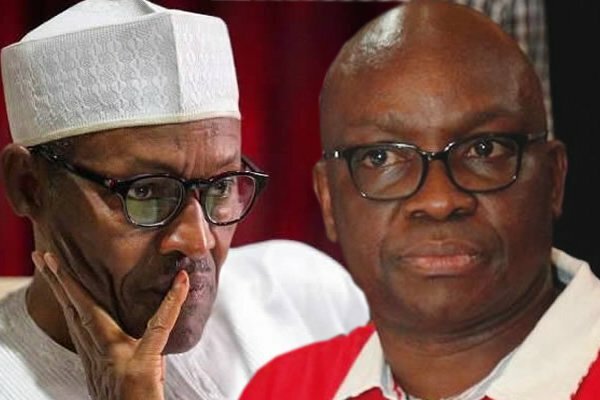 “As we approach the 2019 elections, the return of Ekiti into the fold of progressive states is important as the election of July 2014 is going to be a key pointer to subsequent elections,” President Buhari noted. He stressed that while the party has chosen a candidate through the “very credible and transparent” primary process led by Governor Tanko Al-Makura, the members have a job to build a united front that can propel the APC to victory in the election. President Buhari, who said he has received a full briefing from Governor Al-Makura on the exercise, commended Dr Fayemi for reaching out to his co-contestants with a view to working together. He further appealed to the stakeholders in the south-west region to see the party’s victory at the poll as a collective mission to rescue Ekiti and promote development. Recalling the alleged malpractice that greeted the last governorship election in the state, the President urged the APC put necessary measures in place to prevent subversion of the will of the people. He added that all hands must be on deck to achieve a positive result and asked party faithful to work hard and deliver victory to the APC. “On my part, let me reassure you that you can count on my support – but charity must begin at home. “I urge Ekiti leaders and the leaders from the south-west to take this assignment seriously so that APC can laugh last in the July elections. It is only then that we will all be beneficiaries of victory,” President said. He thanked the APC leaders from Ekiti and the South-west for honouring the invitation he extended to them, saying they are all aware that he does not interfere with the internal workings of the party.